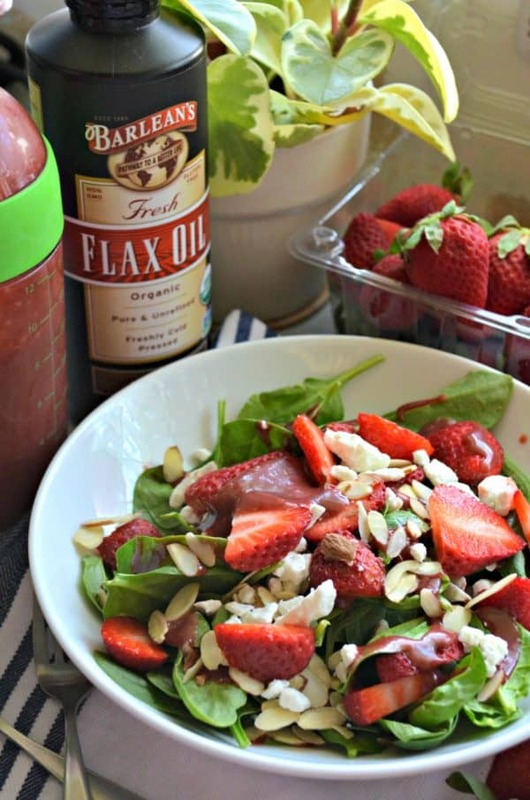 Make my easy recipe for Strawberry Feta Spinach Salad for your next brunch or dinner party! An easy-5 ingredient gluten-free salad that is sure to impress your guest! I ate the most amazing Strawberry Spinach Salad back in January during my press trip with the Florida Strawberry Growers Association. I knew that I needed to recreate it. Once I got back from my trip, I got in the kitchen to start working on the recipe. 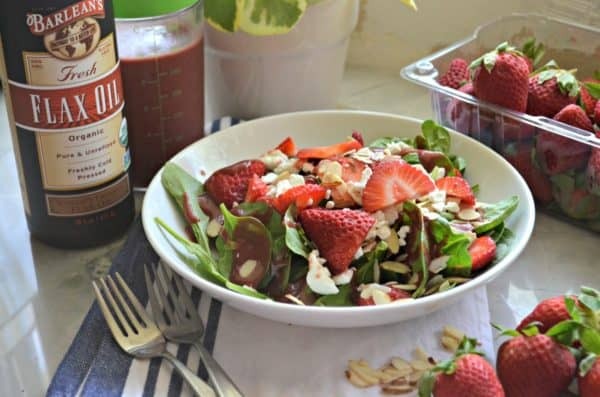 I made my own Strawberry Balsamic Dressing and then I started to experiment with different versions of a Strawberry Feta Spinach Salad. I finally found a combo that most resembled the salad I ate on my trip (minus the sweet candied walnuts). I then brought it with me to a friends house for dinner one evening. Everyone devoured the salad, and at that moment I knew I had a winning recipe. The salad itself takes about 10 minutes to make if you already have the homemade dressing made. The dressing is definitely key to the salad. I like to pour at least a quarter to half a cup of dressing on the fresh spinach itself. Then I add in some of the fresh strawberries, feta and sliced almonds. I give it a really good toss and then let it sit in the refrigerator until guest arrive. Because it’s spinach it’s okay if the leaves are a tad wilted and it actually holds up in the refrigerator with very little wilting for at least one to two hours. Then before serving, I toss it one additional time and top the salad with additional fresh strawberries, feta cheese, and almonds. Place some tongs in the bowl and let your guest serve themselves. Or if you prefer to have plated salads you can plate the mixed salad and then add the topping on to each plate. I like to keep additional Strawberry Balsamic Dressing in a salad shaker next to the salad or on the dinner table. Some people like lots of dressing and others like just a little. This salad is perfect for Easter brunch entertaining or simply for lunch or dinner. However you decide to serve this fresh Strawberry Feta Spinach Salad is totally up to you! Rinse, pat dry, and slice 1 pint of strawberries. Set to the side. Heat a frying pan on high heat, add the sliced almonds and continuously mix for 30-60 seconds until golden brown. Be careful that you don't burn them! In a large salad bowl, add the fresh spinach, 3/4 of the fresh strawberries, half the crumbled feta and half the sliced almonds. Then pour in the the strawberry balsamic dressing. Toss the salad until the dressing is coated evenly. Top the salad with the remaining fresh strawberries, toasted almonds, and crumbled feta. Enjoy immediately or refrigerate up to 2 hours before serving. Disclaimer: Their are affiliate links in this post. That means, if you click and purchase from the link I will receive a small percentage of the sale at no additional cost to you. As always, all opinions are my own. Yes! No more boring salads! You must try this ASAP! A quick dinner idea, thanks so much! My mother love your recipe!